We would be like to thank Ms. Khushbu, a regular and active reader of Appgyaan.com for her contribution and first feedback on the Blog. 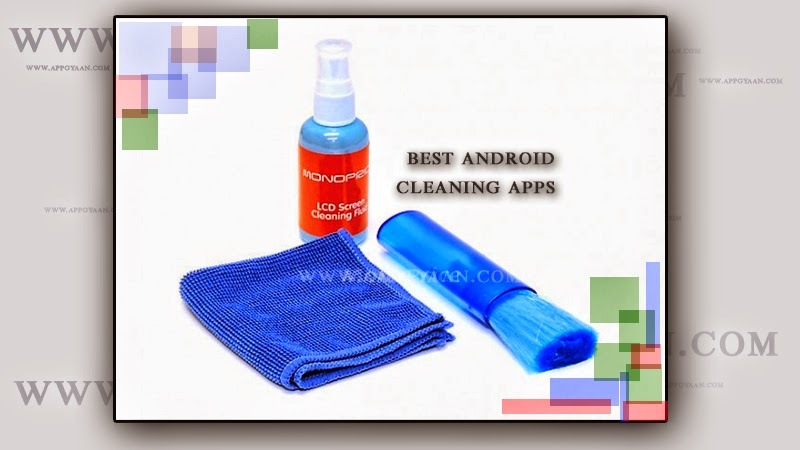 On the request of our reader, we are presenting you the five best Android Apps for cleaning and maintaining your Android smart phones. Periodic cleaning and maintenance of Android smart phones is required in order to maintain speed and space on your smart phone and get most out of the device. The fact regarding the slowing down of the smart phones is that even if quite a few applications or files are installed; the android device will slow down with time. The increase in number of cache files, residual files, junk files and garbage files, etc. Are the basic reasons for such performance-drop. But, cleaning all the junk files one by one is practically impossible. In view of the above, Appgyaan is today recommending the five best apps for maintaining your Android device/smart phone/tablet. The performance of your android devices will boost with Cleaning and maintaining App and helps to prevent slowdowns alongwith additional free space for other resources. In addition, the optimization reduces the system burden by removing the unproductive traces which results in enhancing the performance and smoother operation of the device. First recommendation in Appgyan’s list is ‘Clean Master’. As per our test reports, this is one among best apps which you may use for maintaining the performance of your Android devices. Clean Master is capable of cleaning, optimizing and maintaining your smart phone, all with a single tool. It assists in getting rid of caches, unused files, residual files, search history and uninstalling apps. While comparing ‘Clean Master’ with other apps in this category, it is understood that ‘Clean Master’ has more tools in one environment and is easy to use. It also aids in cleaning the App Cache which increases the internal storage of your smart phones and helps it to boost the performance. 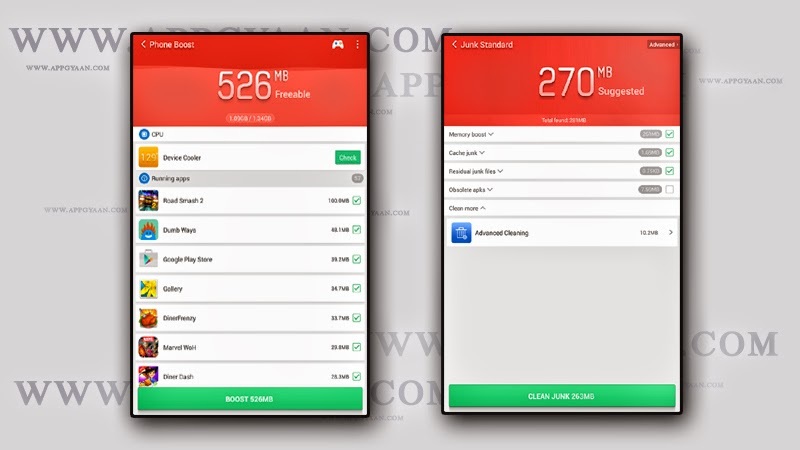 Second recommendation in Appgyan’s list is ‘Android Booster’. 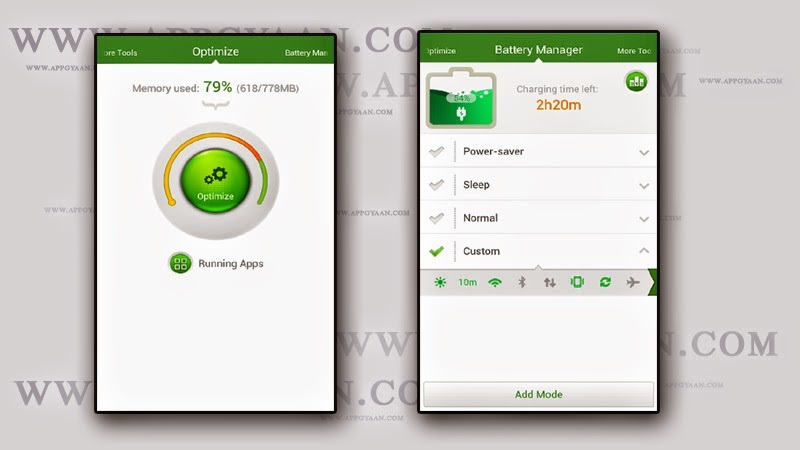 ‘Android Booster’ is the android assistant that is used to clean and maintain the android devices. It helps in optimizing the android device in the best possible way; inturn this automatically improves the Android system performance. In addition to the above, ‘Android Booster’ has got one click optimization feature that optimizes the smart phone completely. 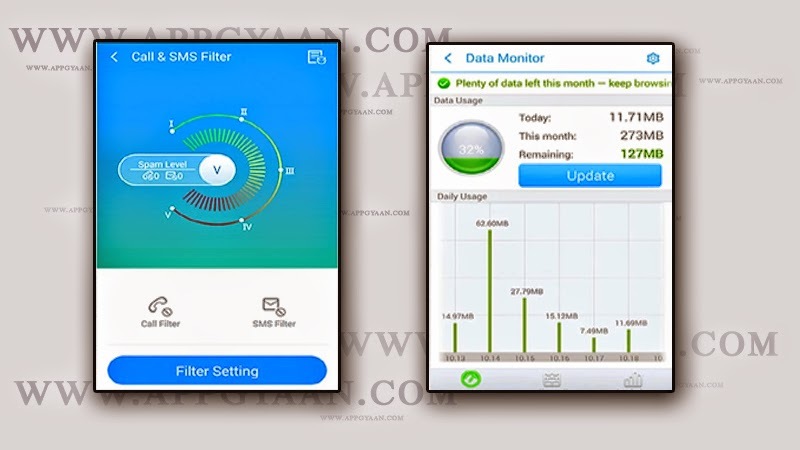 This application also has File manager, App manager and Network manager tools. Last but not the least; ‘Android Booster’ has an additional feature of virus scanner and Privacy Protector. Third recommendation in Appgyan’s list is ‘360 Security’. ‘360 Security’ has complete user friendly features like virus scans, vulnerability scans, and thrash clean-up and memory optimization available in phone check-up section. If ‘360 Security’ is considered as a phone cleaner then the app like all others is all-in-one ‘phone cleaner’ that cleans thrash files and uninstalls residual, private usage history & useless APKs. Further, additional features of ‘360 Security’ are Anti-virus protections, Anti-theft protections, SMS & Call Blocker, Data usage monitor and many more. Aforementioned features of ‘360 Security’ has made it one of the best cleaning and maintaining app for the Android devices. Fourth recommendation in Appgyan’s list is ‘Startup Manager’. ‘Startup Manager’ aids in disabling the undesirable system start up entries while booting of smart phone or tablet. It monitors and displays the list of start-up apps and its resources. If one desires to disable an item from the system start up, you need to uncheck the application from the Startup entries list of ‘Startup Manager’. The application can again be enabled in the same Startup entries list from the resources using Startup manger’s system. One can even uncheck all the Startup entries in bulk to enhance system start up speed of your android device. Fifth recommendation in Appgyan’s list is ‘App Cache Cleaner’. ‘App Cache Cleaner’ is a handy tool which cleans up all the application caches of all the apps which one has accessed on his/her smart phone. ‘App Cache Cleaner’ has one tab cleanup feature that cleans all cached files for creating more space. This tool can create enough of free storage on the smart phones. In case, if you are running out of application storage, you can get more available storage space by cleaning apps created cache/data files in your android phones. Hope you have liked the post. You may install and use any of the aforesaid App on your smart phone in order to keep your Android devices clean and high performing. We hope that once you have gone through the entire post, you would like to share your comments and feedback for more value additions. Please share the article with your acquaintances also who are looking for such regular updates on Android / iOS Apps. I found your blog when I was looking for a different sort of information but I was very happy and glad to read through your blog.!! Thanks Mary.... hope you come to visit App Gyaan on regular basis.